For those of you unfamiliar with Lake Victoria in Alexandria (MN), from above it resembles the letter “C” with a bulge that points north. Not the most eloquent description. I used to tell people it is shaped like a claw or horseshoe. What do you think it looks like? Theid is the Victoria portion of a Rorschach test. Lake Victoria is part of Alexandria’s Chain of Lakes and it gives people the ability to pass through to Lake Geneva via a channel at the northeast side of the lake and to Lake Jessie at the southeast corner of Victoria. 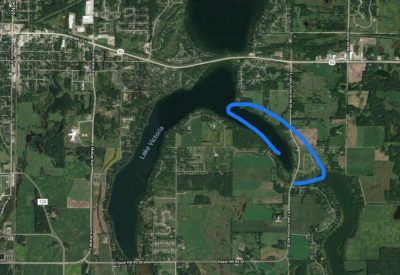 In the video below that I recorded last week on an overcast day you will see parts of the eastern portion of the “C” and then head further east across E Lake Victoria Road (81) and see a little bit of the Lake Jessie Meadows Townhome Association and a little bit of the northwest end of Lake Jessie and the channel between it and Lake Victoria.